A thrilling historical novel by the author of The Secret Healer. Cologne, 1351: Elisabeth and Stephen Hardenstein are twins, but they could not be more different. 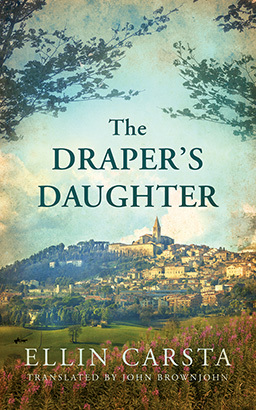 While Elisabeth is inspired by the family business, absorbing everything her father shows her about the cloth trade, Stephen enjoys a leisurely life and pays little attention to their father’s teachings. Elisabeth recognizes her true vocation as a tradeswoman, and though the odds are stacked against her, she pursues her passion. When the twins’ father suffers a tragic stroke, the tables turn. Suddenly Stephen is interested in running the draper’s shop his father left behind, and he takes the lead in managing the family business. But Elisabeth can’t sit idly by and watch as he makes bad decisions and accumulates debts. Stephen pushes her to marry as soon as possible, even proposing a suitor, but Elisabeth has her own ideas about matters of the heart. Are her talents in the art of negotiation enough to win her both the job of her dreams and the man she truly loves?